In the last edition of The Spaniel Journal, Part 1 of this article appeared, and outlined what, for many spaniel owners, would be the new world of the North American Hunting Retriever Association - or NAHRA. This article will be an in depth focus on the United Kennel Club’s Hunting Retriever Club (HRC) and its hunt test program. The astute reader will no doubt notice some significant similarities between the NAHRA program discussed in Part 1 of this article and the that of the HRC. The two organizations share somewhat of a common background; however, that is grist for the mill of a future article. The focus here is on the HRC program and its potential appeal to spaniel owners. As I am the chairman of the Rappanhannock River Retriever Club’s (yes, I play with the retriever crowd as well as the spaniel clubs) inaugural HRC Hunt in September of this year, I had better get this right. This is actually an exciting time in the Virginia hunt test community with many retriever clubs also obtaining UKC/HRC approval for their clubs. There are several Virginia clubs, such as mine, that are chartered to hold three types of hunt tests – AKC, NAHRA and HRC. Like NAHRA, HRC has been primarily associated with the retriever crowd. A quick perusal of the title statistics confirms that HRC has been the preserve of the Labrador retriever. Of the 274 Grand Hunting Retriever Champions, all but eleven are Labradors with only two spaniels - one Boykin spaniel and one English springer spaniel - having attained the highest titles. Much of this skewing toward retrievers stems from the lack of publicity the program has with spaniel owners as well as the extremely large population of hunting Labrador retrievers participating in hunt tests of all types. Let us take a closer look at the HRC program, with the ultimate objective of at least partially rectifying this imbalance. The Hunting Retriever Club’s program includes three primary testing levels, called "hunts" in the UKC system - started, seasoned, and finished levels - but titles are earned on the basis of points awarded for each of the different types of tests. There is a fourth level of hunt, mentioned above, only open to qualifying dogs called the grand hunt. In addition to the hunts, there is a separate category of testing known as the upland hunt that is unrelated to the three standard hunt categories. After the Started Hunting Retriever level, there are several paths toward the various titles of Started Hunting Retriever (SHR), Hunting Retriever (HR), Hunting Retriever Champion (HRCH), Grand Hunting Retriever Champion (GRHRCH) and the additional Upland Hunter (UH) title. Although the UKC program starts out similar to AKC and NAHRA programs, it begins to diverge after the Started Hunting Retriever category. Through all of its levels to include the Upland Hunter title, HRC emphasizes a close alignment of its test with actual hunting conditions. This philosophy permeates all of the test scenarios and sets the HRC program somewhat apart from that of the AKC and NAHRA. Specifically, at all levels of the HRC test program with the exception of the Started Hunting Retriever test, the handler is required to handle a shotgun and fire popper rounds when a bird is either flushed or tossed to simulate actual hunting conditions. At the Started Hunting Retriever level, the handler is not required to do so if the dog is not line steady and the handler must restrain the dog. This striving for test realism is a source of great pride to HRC participants, judges, and cadre, and to be sure adds an element of real field life to the program. "The key to success is practicing a few longer land and water retrieves in preparing for the test." Started Hunting Retriever, the first level of the UKC hunting retriever program, is very similar to AKC’s and NAHRA’s tests at this level. The Started Hunting Retriever test consists of four marked single retrieves - two on land and two retrieves on water (NAHRA has 5 retrieves). The marked land retrieves are not to be longer than 75 yards, while the marked water retrieves may not exceed 60 yards. Started dogs may be held at the line and, at the Started Hunting Retriever level, dogs need not be steady – again very similar to the NAHRA standards. A difference in test procedures occurs if the dog is line steady and the handler elects not to restrain the dog at the line. In this case, the handler must handle the shotgun and shoot poppers at the bird at its apex during the throw. Similar to NAHRA standards, retrieves need not be to hand. The UKC also awards points for the Started Hunting Retriever category. At the Started level, a dog may receive five points per successful pass of a UKC hunt toward its goal of twenty points required to receive the Started Hunting Retriever prefix. Judges will look for retrieving and hunting desire in dogs. At the Started Hunting Retriever level, only dead birds are used and they must be delivered to the immediate vicinity of the handler – a similar standard to that of the AKC Junior Hunter level and the NAHRA Started Hunting Retriever standard. Upon successful completion of the four legs, a dog is awarded the SHR as a prefix to the dog’s name. I think that the Started Hunting Retriever title is definitely within the grasp of a spaniel that has easily passed the AKC Junior Hunter or Senior Hunter levels. The key to success is practicing a few longer land and water retrieves in preparing for the test. After the relatively straightforward Started Hunt level, the UKC program gets a little more complex and there is an element of strategy involved as to how the handler approaches the various levels of hunt. The Seasoned Hunt level consists of five tests: a double marked land retrieve, a double marked water retrieve, a walkup, tracking or quartering test, a land blind retrieve and water blind retrieve. In addition, there must be a diversion bird thrown as part of the test. The distances for the retrieves at this level are predictably longer than for the Started level. Land retrieves may not be longer than 100 yards, water retrieves may not exceed 75 yards and neither land nor water blinds may be longer than 40 yards. There is no set distance specified for the tracking test. Dogs must be line steady at this level without restraint. However, the standards allow for a "controlled break" with substantial penalties, but not necessarily outright failure at the Seasoned level. A controlled break occurs when the dog is at the line and begins a retrieve without command from the handler. If the handler is quick on his toes and recalls the dog before the dog gets too far off the line, a controlled break has occurred. Retrieves must be to hand. A successful pass at the Season testing level results in the award of ten championship points with a total number of points a dog may earn at this level is limited to 40 points unless the dog has previously earned ten points at the Started level. If the dog has Started points, he is allowed to earn a maximum of only 30 points at the Seasoned level. Earning the HR prefix will require that a spaniel essentially perform at the AKC Master Hunter level (all references to AKC hunt tests will be to the spaniel hunt test) without the land series. The water blind is essentially the same distance as specified for the Master Hunter water blind and the land blind is roughly the same distance, as well. The quartering test requires neither to be steady nor to actually flush a bird; therefore, it is actually less demanding than the AKC Junior Hunter standard. The tracking and walkup tests can be a real challenge. The tracking test does not allow the handler to handle a dog or use voice commands beyond an encouraging "dead bird" or "hunt 'em up". The tracking test requires a little thought and training, especially if the test distances are 75 to 100 yards. If the judges elect to have a walkup portion of the test in lieu of either the quartering or tracking tests, the dog must be able to walk at heel, off lead. Potentially, this can be a formidable obstacle for hard charging field bred spaniels. The double land and water retrieves are long. Success on the land and water doubles will require practice with dummy launchers, decoys and a lot of water work. The Seasoned Hunt, in my mind, is an excellent tune up for the AKC Master Hunter level and a big jump from the Started Hunting Retriever test. The highest level of testing, the Finished Hunt test category, sets the bar even higher. A Finished Hunt has four tests: a multiple marked water retrieve, a multiple marked land retrieve, a water blind and a land blind. Either or both of the multiple water or land retrieves must include a diversion bird and an honor of a retrieve by another dog. The blinds may or may not be included in the multiple marked retrieves. There is an additional option of an upland hunting test (not to be confused with the Upland Hunt category) and this is equivalent to the AKC spaniel Master Hunter land series. Not every Finished Hunt includes the upland hunting test and the rules require this test to be announced in advance of the hunt in the premium (or application) for the test. There is a considerable amount of judges’ discretion in the construction of test scenarios at the Finished Hunt level. Maximum retrieve test distances at the Finished Hunt level can be considerable. The land maximum distance is 150 yards, the water limit is 125 yards and the blinds a whopping 100 yards. A successful completion of a Finished Hunt level test nets the dog fifteen championship points per hunt with no specified maximum number of points. These distances are extremely long for a spaniel, and the test itself is significantly beyond the AKC Master Hunter level test scenario. This is not to say, however, that the test is beyond the capability of spaniels. Not at all. But it does require a training program geared to the test. These Grand Hunts are held semiannually over a four-day period and are only open to dogs possessing the HRCH title. The remainder of the points must come from successful completions of the Finished Hunt tests. These are highly advanced tests with five events: a multiple marked water retrieve, multiple marked land retrieve, a water blind, a land blind and an upland game and quartering test. The judging is very tough with callbacks used at each level to reduce the field. The tests are extremely difficult and I equate this test with the AKC’s Master National on the retriever side of the ledger. However, there is no equivalent spaniel variety at AKC. To date, there have been only two spaniels that have achieved the GRHRCH title - one dog is Serge Rasatta’s English springer, Remy, an extremely talented dog. Several years ago and early in my hunt test career (such as it is), I had the distinct privilege to witness Remy finish his AKC Master Hunter title in Pennsylvania. I watched Serge give Remy a line on the water blind retrieve, and Remy lined it. I was, to say the least, awestruck. Chris Meurett’s Mule, one of Pam Kadlec’s superb Boykins, also holds the GRHRCH title. Mule is a high-performing spaniel of the first order. Finally, the HRC’s relative newcomer to the hunt program is the Upland Hunt, designed specifically for the upland game hunting situation. 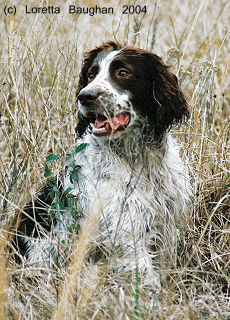 The UH title, on the surface, offers much to spaniel hunt test enthusiasts. It possesses many of the elements that spaniel owners and handlers have heretofore associated with the AKC spaniel hunt tests, but starts at a significantly higher plane. This Hunt consists of walkup test, a quartering test with flushed and shot birds and optional tracking test. For the walkup portion of the hunt, the dog must be able to heel off lead and remain line steady for the flushed and shot bird. The Upland Hunter standards require that a dog must not only be steady to flush and shot, but must honor another dog’s flush and retrieve of the shot bird. 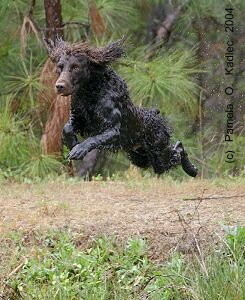 During the test, the dog must demonstrate advanced handling capabilities with all retrieves to hand. In addition, the handler must track the flushed bird with the shotgun and fire the popper in order for the gunners to shoot the bird. This requires a quick, but safe, execution of the shot by the handler in order for the gunners to have a reasonable chance of downing the bird. Upon successful completion of four Upland Hunt legs, a dog may earn the title of Upland Hunter (UH) with ten championship points awarded per successfully passed Upland Hunt leg. I equate the performance level of the dog in the Upland Hunter program to that required by the AKC’s spaniel Master Hunter land series. 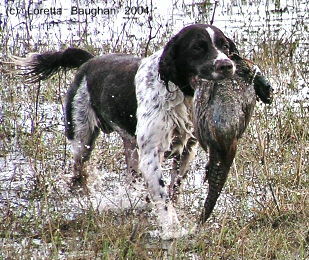 Dixie, my English springer Master Hunter, has one leg (she is one for one) toward her Upland Hunter title. "To be awarded the coveted Grand Hunting Retriever Champion (GRHRCH) a dog must be virtually capable of walking on water, levitation, and prestidigitation." The HRC point system is an essential feature of the hunt program and, like NAHRA, point accumulation contributes to higher titles and may continue for as long as the dog participates in the HRC hunt program. There are, for example, HRC 500, 1000, 1500 and even 2000 point clubs. As one would assume, there are fewer members as the point requirements get higher. For example, there are only two members of the 2000 point club at present. It is the point accumulation system connected with successive passes of hunts at the senior level that gives the HRC program a broad appeal. Like NAHRA, but unlike AKC, the HRC program has anticipated that dog owners and handlers would want to participate in the program beyond the HRCH or GRHRCH title levels. The point system enables dogs to continue to play the hunt game until they retire from the field. It is a hallmark of the hunt program and a deeply ingrained HRC philosophical approach to the entire testing process. Once a dog has passed the requirements of particular level, the dog earns a title that appears as prefixes to the dog’s UKC-registered name. As we have seen, to be awarded the Started Hunting Retriever (SHR) prefix, a dog must have four successful passes of the Started Hunt testing level or 20 points. All of these points must be earned at the Started level. For the next level up, the Hunting Retriever (HR) title can be earned in a number of ways. For example, a dog could first earn a SHR and have ten points in the bag toward the HR title then be required to pass the Seasoned Hunt level three times in order to earn sufficient points for the HR title. But nothing precludes the dog from passing up the SHR title and going directly to the HR title by passing the Seasoned Level four times to amass the necessary points. Finished Hunt successful completions also may be used to complete the HR title requirements. However, here it gets tricky. Once you have earned points through passing a higher level hunt, you cannot then drop back to the lower level to earn championship points. The requirement for HR is 40 points. To earn a Hunting Retriever Champion (HRCH) title, a dog must earn 100 points of which 60 points must be earned by passing Finished Hunt tests. The other 40 points can be earned either entirely from Seasoned Hunt tests or from a combination of Started (ten points maximum) and Seasoned (30 points maximum) tests. To be awarded the coveted Grand Hunting Retriever Champion (GRHRCH) a dog must be virtually capable of walking on water, levitation, and prestidigitation. The dog must have amassed 200 points beyond the HRCH title (a total of 300 points) with 80 of the 200 coming from two successful completions of the Grand Hunt test. This, in brief is the HRC hunt program. It is a dynamic hunt test program that offers those dedicated to the spaniel breeds a solid opportunity for testing their dogs. I have enjoyed participating in HRC hunts, and have found those participating and judges to be very favorably disposed toward the participation of spaniels in their program. At present Dixie, in addition to working on her Upland Hunter title, also has two Started passes to her credit. Arwen, my little English cocker, is signed up for her first HRC test this spring. The verdict is still out on her. Those interested in the HRC program should consult HRC for more information. Claudene Christopher, a warm and gracious person, is HRC’s Administrative Secretary and an excellent source of information on HRC’s program. Visit the UKC’s website at UKC to glean information on the UKC’s straightforward registration requirements, HRC hunt schedule, and rules and regulations for HRC hunts. 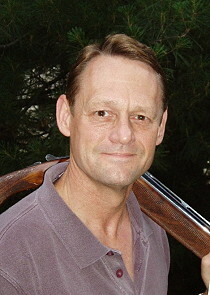 Chip Schleider is an avid amateur spaniel trainer and upland game hunter. He owns four dogs - one English springer spaniel and three English cocker spaniels. His English springer, Dixie, just received her Master Hunter title and is a Started Retriever in NAHRA. He also is marketing executive for a large aerospace company, and retired Army Lieutenant Colonel with a doctorate in international studies from the University of South Carolina. He lives with his wife Door, youngest son Alexander, and two of his gun dogs, Dixie and Arwen, in Great Falls, Virginia. His oldest son, Christian, is an Army First Lieutenant stationed in Iraq.